The Phillies have signed right-hander Mike MacDougal and assigned him to Triple-A Lehigh Valley, tweets Lehigh Valley radio announcer Matt Provence (via Matt Gelb of the Philadelphia Inquirer on Twitter). The 36-year-old was released by the Reds earlier this month. Lefty reliever Brian Tallet has retired, reported Burt Wilson of Lancaster Newspapers. MLBTR has confirmed the news; Tallet is pursuing a career in coaching. Tallet pitched to a 4.79 ERA in nine seasons with the Indians, Blue Jays, and Cardinals, earning over $5MM. He pitched for the Padres' Triple-A club last year, joining the Lancaster Barnstormers of the Atlantic League this spring. Tallet was a useful reliever for the Jays from 2006-08, compiling a 3.38 ERA over 173 innings. He was known for sporting quality facial hair. The Reds released outfielder Joe Mather, Baseball America's Matt Eddy revealed in his minor league transactions post for June 13-19. Mather had signed a minor league deal out of the Atlantic League with the Reds in May, but hit .174/.287/.291 in 102 Double-A plate appearances. Mather was drafted by the Cardinals in the third round in 2001, a round that also produced big leaguers Scott Hairston, Jack Hannahan, and Ryan Theriot. Eight players currently reside in DFA limbo: Wade LeBlanc of the Astros, Quintin Berry of the Royals, Eric Thames of the Mariners, Josh Wilson of the Diamondbacks, Jose Valverde of the Tigers, Collin Cowgill of the Mets, Yamaico Navarro of the Orioles, and Ross Seaton of the Astros. The Padres traded for Pirates left-hander Brian Tallet, according to Corey Brock of MLB.com (via Twitter). Pittsburgh will either receive cash considerations or a player to be named later for the reliever, Brock tweets. Tallet, 34, owns a 4.79 ERA with 6.6 K/9 and 4.2 BB/9 across nine seasons in the majors. Last season, the left-hander saw just 13.1 innings of work for the Cardinals and Blue Jays thanks to a broken left hand followed by a right intercostal strain. The Pirates signed left-hander Brian Tallet, Kevin Goldstein of Baseball Prospectus tweets. In 13 1/3 innings for the Cardinals and Blue Jays last year, Tallet posted a 9.45 ERA with 6.8 K/9 and 4.7 BB/9. He was effective against left-handed hitters in 2010, but missed time in 2011 with a broken left hand and then a right intercostal strain. The Angels signed left-hander Greg Smith to a minor league deal, Matt Eddy of Baseball America tweets. Smith, who last appeared in the Majors in 2010, posted a 4.16 ERA in 32 starts as a rookie with the 2008 Athletics. The 28-year-old posted a 3.88 ERA with 6.1 K/9 and 3.1 BB/9 in the minor leagues last year. The Blue Jays have released left-hander Brian Tallet, according to their team transactions page. Toronto designated Tallet for assignment on Wednesday, less than 24 hours after surrendering a walk-off win to the Orioles. That outing against the O's was Tallet's only appearance for the Blue Jays in 2011 after coming over from the Cardinals. The reliever was shelved with a broken left hand and then a right intercostal strain. In nine big league seasons, Tallet owns a 4.79 ERA with 6.6 K/9 and 4.2 BB/9. Brian Tallet's return to Toronto couldn't have gone much worse. The left-hander, who suited up for the Blue Jays from 2006-10, returned to Toronto's roster this summer, only to spend time on the disabled list then give up the game tying and winning runs in his only appearance for the Jays. Less than 24 hours after serving up a walk-off win for the Orioles, Tallet is off of the roster. The Blue Jays announced that they have designated him for assignment to create roster space for Carlos Villanueva, who is returning to the active roster from a stint on the disabled list with a right forearm strain. In 13 1/3 innings for the Cardinals and Blue Jays this year, Tallet has a 9.45 ERA with 6.8 K/9 and 4.7 BB/9. He was effective against left-handed hitters in 2010, but missed time this year with a broken left hand and then a right intercostal strain. Trever Miller, another former Blue Jay who returned to Toronto in the Colby Rasmus deal, suffered the same fate as Tallet, getting designated earlier in the month. The price the Cardinals paid to acquire Jackson and bullpen help was "just too high," according to ESPN.com's Keith Law, who suggests St. Louis' internal emphasis is on manager Tony La Russa, not the players. Law loves what Toronto did and doesn't understand Chicago's move. Joel Sherman of the New York Post confirms that the Cardinals turned down the Rays' offer of Jeff Niemann and J.P. Howell for Rasmus (Twitter link). Sherman suggests the Cardinals would have been better off accepting Tampa Bay's offer. The Giants showed how to go for it today and the Cardinals showed how not to go for it, Yahoo's Jeff Passan writes. A longtime scout tells ESPN.com’s Buster Olney that Rasmus has a chance to be a star. “I don't understand that deal at all," the scout said (Twitter link). Matthew Leach of MLB.com likes what the Cardinals got for 2011, but finds it hard to like the deal for St. Louis because of what it means for 2012-14 (Twitter link). Now that Rasmus and Carlos Beltran are off of the market, the list of teams with possible interest in B.J. Upton is taking shape, as Marc Topkin of the St. Petersburg Times explains. The Braves, Indians, Nationals, Phillies, Pirates and Reds are possible destinations for Upton. As Matt Eddy of Baseball America explains, Walters should qualify for a fourth option year in 2012 and Rzepczynski "might be the prototype" pupil for Cards pitching coach Dave Duncan. Joe Pawlikowski of FanGraphs explains that it's easiest to see the trade from the Blue Jays' perspective, since they gave up three relievers and a prospect for a player who can help them contend for 2012-14. At CloserNews, Dan Mennella wonders if Kyle McClellan could be in line for some saves, now that he's back in the bullpen. I agree with Tim and many of the others above- it’s a win for the Blue Jays. Let’s not forget how much has to be in place for this kind of deal to happen: a creative GM who reads the market well, payroll flexibility (for Teahen’s contract), willingness from ownership to take on salary, enough appealing prospects to be able to part with Stewart and enough bullpen depth to send three quality relievers packing on the same day. This trade doesn’t seem simple and in some ways it may actually be more complicated that it appears. An eight-player deal was struck today, as the Blue Jays announced they've acquired center fielder Colby Rasmus and pitchers Trever Miller, Brian Tallet, and P.J. Walters from the Cardinals for starter Edwin Jackson, relievers Marc Rzepczynski and Octavio Dotel, outfielder Corey Patterson, and three players to be named later or cash considerations. ESPN's Buster Olney first tweeted the full details. In Rasmus (pictured), Alex Anthopoulos acquired a good young player who had worn out his welcome with management, much like the Blue Jays GM did with Yunel Escobar last summer. Rasmus, 24, is hitting .246/.332/.420 in 386 plate appearances, a down year compared to 2010. He'll be arbitration eligible for the first time after this season, so he's under team control through 2014. Cardinals GM John Mozeliak recently called a Rasmus trade "highly unlikely," but as Strauss notes, the center fielder has "fascinated and frustrated" the Cardinals over the last three years and made repeated trade requests. Mozeliak shopped Rasmus to the Blue Jays, Rays, and Red Sox, reports Joe Strauss of the St. Louis Post-Dispatch. 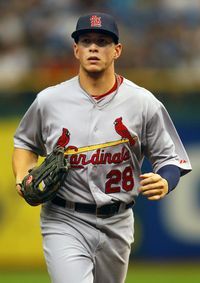 He adds that prior to public criticism from manager Tony La Russa earlier this month, the Cardinals were in contract extension negotiations with Rasmus. Miller, 38, has been used sparingly by the Cardinals this year, logging only 15 2/3 innings. Most of them came against left-handed hitters, but Miller hasn't pitched well no matter how you slice it. About $700K remains on his contract. Tallet, 33, has been ineffective as well and currently resides on the DL for an intercostal strain. He spent the previous five seasons with the Jays. About $263K remains on his contract. Walters, 26, has logged 50 innings in the bigs since 2009. The righty has a 4.27 ERA, 7.6 K/9, 3.7 BB/9, and 0.8 HR/9 in 103 1/3 Triple-A innings this year, his fourth stint at the level. Baseball America ranked him 19th among Cardinals prospects prior to the season, praising his plus changeup but projecting a long relief/swingman role. Jackson, 27, was traded for the fifth and sixth times in his career today. The 27-year-old flourished in nearly 200 innings with the White Sox, and improves a Cardinals rotation that ranks seventh in the NL with a 3.84 ERA. The acquisition gives the Cards the flexibility to move Kyle McClellan back to the bullpen, leaving a rotation of Chris Carpenter, Jaime Garcia, Jackson, Jake Westbrook, and Kyle Lohse. Jackson, a Scott Boras client, figures to test free agency after the season as a Type B. About $2.9MM remains on his contract. The Cardinals' bullpen gets a lift from Dotel, Rzepczynski, and McClellan. Dotel, 37, has a 3.68 ERA, 9.2 K/9, 3.7 BB/9, 1.53 HR/9, and 28.6% groundball rate on the season; he excels against right-handed batters. Should the Cardinals turn down his $3.5MM club option, Dotel projects as a Type B free agent in the AL at the moment. If the option is declined, about $1.7MM remains on Dotel's contract. Rzepczynski, 25, switched to full-time relief this year. He has a 2.97 ERA, 7.6 K/9, 3.4 BB/9, 0.46 HR/9, and strong 65.7% groundball rate in 39 1/3 innings this year. He complements Dotel nicely, having dominated lefties and struggled against righties. Rzepczynski is under team control through 2015. Dotel and Rzepczynski do not appear to be a threat to closer Fernando Salas, writes Dan Mennella of CloserNews. Patterson, 31, is hitting .252/.287/.379 in 341 plate appearances for the Blue Jays this year. He restores a little bit of outfield depth for St. Louis. Though there are eight players in this deal, it mostly boils down to the Cardinals renting Jackson and Dotel and getting Rzepczynski long-term in exchange for Rasmus' three arbitration years. It's hard to see this as anything but a win for the Blue Jays. Ultimately Rasmus cost the Jays Zach Stewart, Jason Frasor, Dotel, Rzepczynski, and Teahen's contract. 12:08pm: The Cardinals will send Rasmus, Trever Miller, Brian Tallet, and P.J. Walters to the Blue Jays for Jackson, Rzepczynski, Dotel, and Corey Patterson, tweets ESPN's Buster Olney. Olney adds that Miller is then expected to be traded to the White Sox. 12:01pm: This trade is not yet official because of the money involved, tweets Danny Knobler of CBS Sports. He says that aspect may need to be reworked before it's approved. 11:35am: A trade of Rasmus to the Blue Jays for Jackson, Dotel, and Rzepczynski is imminent, reports Joe Strauss of the St. Louis Post-Dispatch. He says an announcement could come early this afternoon. 11:22am: Edwin Jackson is definitely going to be traded by the Blue Jays, tweets SI's Jon Heyman. Heyman heard it's going to be for Cardinals outfielder Colby Rasmus. Rasmus being under team control through 2014 and still highly-regarded, the Cards will require more than just two months of Jackson. The two teams have talked about Marc Rzepczynski and Octavio Dotel, notes Olney, and Jon Paul Morosi of FOX Sports tweets that the Cards asked about outfielder Eric Thames. Rasmus is a popular trade target. ESPN's Buster Olney tweets that the Rays offered one of Jeff Niemann, Wade Davis, and Alex Cobb, and the young center fielder is very much available. The Indians have interest as well. The Cardinals signed Brian Tallet to a one-year contract, according to Jon Paul Morosi of FOX Sports (on Twitter). The southpaw posted 8.6 K/9 and 1.8 BB/9 against lefty batters last year and should continue to be productive against them in Tony La Russa’s bullpen. The 33-year-old posted a 6.40 ERA with 6.2 K/9 and 4.4 BB/9 in 2010, his fifth season in Toronto. Tallet earned $2MM in 2010 and was headed for a raise through arbitration until the Blue Jays outrighted him to Triple-A. He refused the assignment and hit free agency before I named him as a potential bargain reliever. The Blue Jays used Tallet as an occasional starter, but Morosi hears that the Cardinals will use him as a reliever. That makes sense, since they have Adam Wainwright, Chris Carpenter, Jaime Garcia, Jake Westbrook and Kyle Lohse in their rotation.